Imagine attempting something 20 times and not succeeding. Most of us would give up. I’ve seen folks who get all jazzed up about working out. They work out for 2 weeks and then quit as they didn’t see the results they wanted. 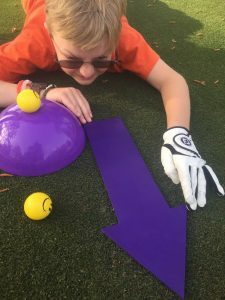 We see students who come for private lessons, take 1 lesson and then give up the improvement process when they don’t shoot a career low round the first time out. I admit, if I tried something 20 times and didn’t succeed I might give up too! Not this young man. Luke started his journey with us on May 17th, 2015 when he attempted to beat 36 from 25 yards. He passed in his first attempt shooting a 36. One week later on May 31st, 2015 he shot 40 from 50 yards. I’m sure he felt like after a few attempts he would be on to 100 yards. 1 year, 3 months and 11 days later he shot a 35 on September 11th, 2016 to pass 50 yards. As you can see in his graph, Luke shot as low as a 37 from 50 yards and as high as a 52 and 55. What a wonderful life lesson he has learned in terms of delayed gratification. In golf as in life, success does not come easy. Thanks Luke for not giving up!